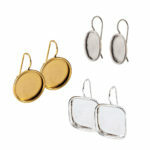 Nunn Design Wire Earrings bezels are formed from stamped brass and have a brass ear wire soldered on to the backside with lead-free solder. 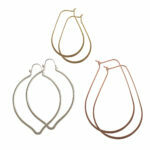 All Wire Earrings are plated nickel-free with 24k gold or .999 fine silver. All of this process is produced in the USA.